Lighter colored contacts make me look a little bitchy, don't you think? Also, I made a sock bun today! My hair is pretty long but layered so making big bun was never easy. The sock donut I made is not that big since it was my first one, but I want to make a couple more in different sizes! Hi Lena! I love this look on you. It doesn't look bitchy to me but rather sophisticated! Growing out my hair after my disaster with split ends. Hoping to do a nice big bun soon! Wow. Your eyes are so pretty. Wish I could tolerate contacts. Love the subtle smokey eye! wow this looks gorgeous hun! Love the bun! The soft smokey look is really pretty, definitely perfect for a first date! i am so late to the party. i didn't know people use bun enhancers(?) like this. i just thought they all have lots of hair. i like the contacts but i don't think i'd repurchase this once expired. i've found more natural looking light colored ones. yeah, sometimes wearing contacts and makeup could be too much for our poor eyes. i am growing my hair a little longer as well. i am so itching to get it trimmed, though. Wow, absolutely gorgeous! you have such amazing skin! I'm always for looking bitchy, but that's just me. hahaha. I think the contacts look lovely! and I really love pink + grey together. I love this look on you! I think you can get away with your lenses too, because your skintone is light and leans cool. On me for example they'll look REALLY weird! 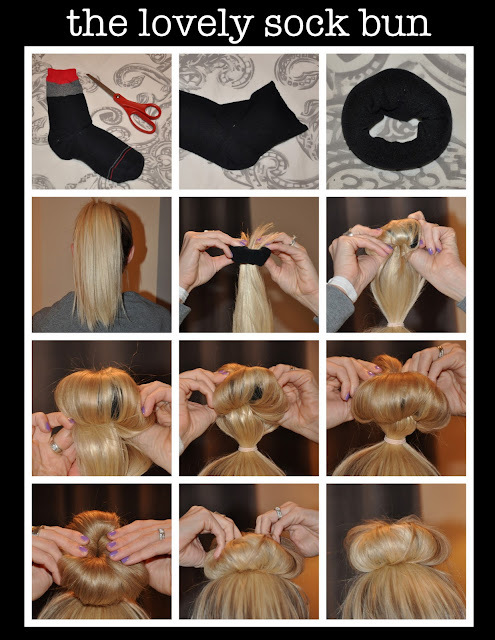 wow, your sock bun came out nicer than the tutorial one too! I used to do this when I was in high school and I wanted to hide my perm. Yes, I got a perm in high school, don't ask me why! I love this eye make-up. Have a great weekend my dear! Pretty Pretty! love the smokey eye look. Goes great with your eye color hun! lol super big onion hair! The bun looks really pretty on you! I've never tried using a sock before to get that big bun look. Can I just say when I read sock bun I laughed as that was exactly what I was experimenting with before my major event this week. I was going for a Carrie bun! i wanna do this look during events..
heh heh i love carrie bun! it is huge! i don't think you'd need any of enhancement like this for big bun. your natural hair would just do, right? most of lenses are designed to work with dark eyes, i am sure they will look good on you as well. purchasing lighting set is so worth it since it makes my skin look better in pictures. This look is beautiful! It goes very well with the contacts too! i think any blue/grey shimmer eyeshadow would do, really. Looks glamorous compared to my boring workday makeup lol. Great pairing with the contacts! thanks for leaving me your link. i have combination skin as well. i tend to get oily on my T-zone. i think photoready liquid is good for all around except for summer for me. i think it should work for you as well. there is a mouse version which seems to control oil better. you look lovely..a bit ice queen-y not bitchy! it makes me feel much better. i think sock bun works easier for shorter hair, but layers are always a bit of hassle. i have the same problem. always need tons of bobby pins. You eye makeup just gets better and better. I love the contrast from your lenses to a smokey look. So pretty, beautiful skin too!! !